If there’s one thing I love more than a good Irish brand, it’s a good Irish brand doing good. This is the perfect example. 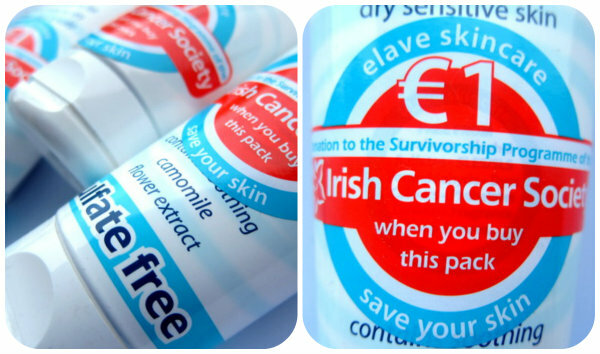 For the second year running, Irish skincare brand Elave has teamed up with the Irish Cancer Society. Until the end of June, €1 from the sale of selected Elave products will be donated to the Survivorship Programme. The programme works with newly diagnosed cancer patients and provides them with support and reassurance from people who have undergone a similar experience, and come out at the other side. Elave specialise in sensitive skincare solutions – they avoid harsh chemicals and are a real boon for those with sensitive or dry skin, or who are prone to conditions like eczema, rosacea or psoriasis. For this reason they are also suitable for those who are undergoing treatment for cancer and who find their skin is more delicate and sensitive than before. Products include the brand’s shower gel, shampoo and intensive cream and I can personally vouch for all three. Since I started swimming on a regular basis I am showering and washing my hair more often, and I need something that is gentle but effective, and won’t strip my skin (or my hair colour!). This trio is just the ticket. The products are also excellent for anyone with dry or sensitive skin, any of the skin conditions I mentioned above or who is undergoing treatment for cancer, when your skin often becomes more delicate and easily irritated. Find them in all major pharmacies, including Boots, from May. Elave's shower gel and shampoo are €7.10 and the Intensive Cream, a really good face or body moisturiser, is €8.49. You can contact the National Cancer Helpline on Freephone 1800 200 700. It’s open Monday-Thursday from 9am to 7pm and Friday from 9am to 5pm. What an excellent product and collaboration. It's nice to see more companies doing this. Fabulous! Such a worthy cause & I love how you support your home grown brands! The Diorshow Art Pen is the dogs!!! Thanks guys hope those of you who can will pick up some of the products with the big red sticker! Hi dear, you are an excellent ambassador for your local products, this one sounds good and for a great purpose too. I agree with the comments above...what a great initiative. If only more companies would do this kind of thing, esp. skin care ones, eh? Elave sounds like a great line, but unfortunately, I haven't seen it here yet in Canada.